When will be Silent Mobius next episode air date? Is Silent Mobius renewed or cancelled? Where to countdown Silent Mobius air dates? Is Silent Mobius worth watching? It is well known that Japanese animation has been vastly influenced by the North American high budget Sci-Fi and Fantasy cinema. James Cameron's TERMINATOR, George Lucas' STAR WARS saga, Dino Di Laurentiis's CONAN THE BARBARIAN, the famous HEAVY METAL and Ridley Scott's ALIEN quartet have all had a TREMENDOUS influence on anime. However, none of them has had as much influence on anime writers, directors and designers as the latter director's masterpiece; the now famous BLADE RUNNER, one of the cult movies of the 1980's. Many animations, such as BUBBLEGUM CRISIS, AKIRA, and CYBER CITY OEDO 808, have simply borrowed the spirt of Ridley Scott's classic (Priss's band in BGC was named "Priss & The Replicants"! ), but it was Kia Asamiya who borrowed the most from BLADE RUNNER, by making it both the visual AND spiritual inspiration for his own masterpiece, SILENT MOBIUS (we know, it is supposed to be written MOEBIUS, but the Japanese translated it as MOBIUS. The BLADE RUNNER feel, mixed with Asamiya's beautiful art and cool story, gained SILENT MOBIUS rave reviews from its readers, so much that in 1991, Kadokawa Shoten, the manga's publisher, decided to fund the production of a high quality motion picture, which was a total success at the Japanese box office. Beautiful animation and designs (Michitaka Kikuchi and Yazuhiro Moriki, who both worked on ZEORYMER, were responsible for both), as well as a cool story and an incredible soundtrack (the ending song, "Sailing", won the prize of best anime song of 1991) makes SILENT MOBIUS: THE MOTION PICTURE one of the best anime movies of the decade. A second movie, just as good as the first one (in our opinion, anyway…), was released in 1992, but was not as successful as the first one. Then SILENT MOBIUS sent silent (no pun intended) for years. As we can see, this series directly follows the two movies, as it begins with Katsumi's enrollment in AMP. One of the most apparent transgressions from the manga is the presence of Mana Isozaki (a character that only appears around volume five of the manga) at the very beginning of the series. The Character designs, although slightly different in details (Lebia and Kiddy have their manga hairdo, etc. ), are very reminiscent of the movies', with their small eyes and less complicated uniforms. This however, does not apply to Lum Cheng, who has the big googly eyes Asamiya is known for in his manga works. The animation is very nicely done for a TV series, with fluid movements and well detailed backgrounds. There are also a lot of well integrated CGI scenes (the opening uses these with great efficiency), even if the integration is not as flawless as, let's say, TENKU NO ESCAFLOWNE or COWBOY BEBOP. The soundtrack, with its techno-like atmosphere, is excellent, even if somewhat different to that or the two movies. The opening song is not bad, but we found the ending song, with its English lyrics, to be rather weak (we are always a little wary of anime songs entirely performed in English. The TV series' story is somewhat better than that of the movies, mostly because there is more time for character development, something the two movies were incapable of doing because of time restraints (they were 50 minutes each, hardly enough time to establish proper characterization). In the TV series, each of the main characters gets one or two episodes (except, or course, Katsumi and Rally, who get more) to tell their personal stories and why they were chosen for AMP. In short, the TV series pretty much follows the story pattern of the manga and even gives us an idea of what the manga's ending will be like. All in all, we are quite satisfied with this series. 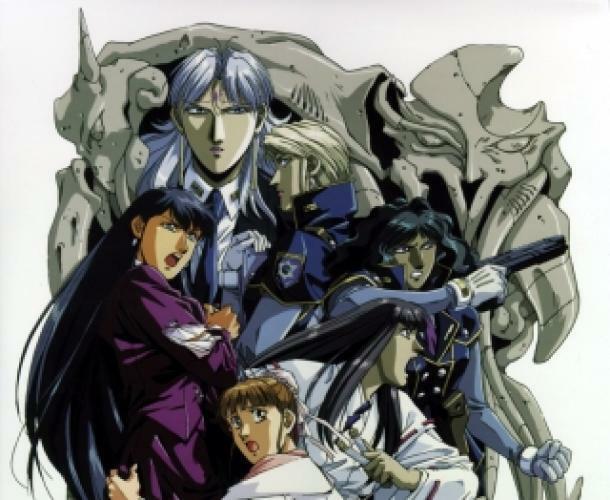 It develops the world of SILENT MOBIUS in all the points that the movies could not and gives us a rather well presented animated version of the manga. Our fears were that the animation would be low quality, due to Kadokawa's monetary problems, and that the series would only be a remake of the two movies. Thankfully, these fears proved unfounded. If you are a SILENT MOBIUS fan, this series is definitely for you. The SILENT MOBIUS manga has a special meaning to us, for it is the one who gave us, near the end of the 1980's, the first chance to see the incredible work of Kia Asamiya. We had already seen some other manga works (such as AREA 88 and NAUSICAA), but Asamiya's cover art for SILENT MOBIUS had a little something that was different. Maybe it is his choice of colors (he often uses a kind of purplish neon blue that we fine absolutely gorgeous) and the way he uses them to create a kind of weird atmosphere. Anyway, it was the cover art of SILENT MOBIUS #1 that made us want to buy this $40 manga at such a price (manga were costing LOADS of money in those days… Well, they still do, but as much as they used to…). The book was wrapped, so we were bracing for the shock of discovering that the interior art was not as good as the cover's. All this worrying proved to be useless, for the interior art, while a little simpler, was just as good as the cover's! Of course, the story was lost on us (we did not even have a basic knowledge of Japanese), but that was not really important to us in those days. Then Viz decided to release the translated version of SILENT MOBIUS in 1992 and all became clear. However, Viz (in the hope of pleasing a North American readership) had decided to colorize the manga and let's just say that the results was not exactly wonderful, as Asamiya used a lot of Zip-A-Tone in his first works and the colors, applied over the Zip-A-Tone areas of the art, made for an horribly dark mess. Only a few parts were printed in color, then Viz went back to the original B & W. The publication of SILENT MOBIUS then stopped for a few years. It has re-started only a few months ago, but this time, things are as they should have been at the beginning: Graphic Novel format, more than 250 pages each and in black and white. Volumes 1 to 7 are currently available for purchase at www.viz.com. These GNs are exactly what we, North American Kia Asamiya fans, needed, as they collect the SILENT MOBIUS volumes exactly the same way the Japanese version did (except that the first few pages are not color, which is a shame). Let's just hope that Viz Comics will be able to publish the whole story (more that 10 volumes to date). For those who wonder if the story in the manga is similar to the movies', we are sorry to say that the two SILENT MOBIUS movies were, story wise, not as good as the manga, for they assumed that you had read it (which was not our case when we first saw them…). If you want to read this near-legendary manga, this is the time to do it! Lebia Maverick- Lebia is the AMP's second in command and a class "A" type "Visionnaire" (a person who can travel in Cyberspace) being, as such, the eyes and ears of the AMP. Her brain is linked to a geo-stationary satellite named Donald (hence the names "Huey","Duey" and "Louey" of Lebia's other computers), which gives her more than 3,000 times the data capacity of a normal Visionnaire. Lebia's father is Stephan Maverick, on of the creators of the Cyclotron. She is standoffish and likes to be right, making herself somewhat annoying to others. Yuki Saiko- Yuki, like Nami, is a psychic, but her powers enable her to see the future, making her essential to the AMP's operations. She was not born a psychic, but became one while under treatment in the YLEM (the government's Human Weapon Development Plan). The other members of the AMP treat her like a mascot. Yuki is the youngest member of the AMP and her powers are still in their infancy. Gigelf Liqueur- Gigelf is Katsumi's father. He was a great sorcerer who joined the Project Gaia in 2001. He met Fuyuka while on a trip to Tokyo and fell in love with her. One of Gigelf's most powerful weapons was Grosspoliner, the King of Swords, who is now bound to Katsumi by blood, just like he was with Gigelf. Gigelf died in 2006, in a failed attempt to close the gate to Nemesis, a failure that haunts his family bloodline to this day. Katsumi's mother, Fuyuka used to be one of the most popular newscasters of all Japan. She met Gigelf while reporting on the Gaia Project and fell in love with him. Using her life force, she sealed the powers of her daughter to give her a normal life, but sacrificed her health in the process. She dies protecting Katsumi, who keeps her mother's dagger as a keepsake (in fact, the dagger still contains a part of Fuyuka's spirit, which often intervenes on Katsumi's behalf). He used to be one of Gigelf Liqueur's most promising students and aide. He joined Project Gaia with Gigelf, but was, somehow, seduced into serving the dark purpose of the Lucifer Hawk. In exchange for his help in betraying his master and the human race, he is now immortal and wields great powers. EpisoDate.com is your TV show guide to Countdown Silent Mobius Episode Air Dates and to stay in touch with Silent Mobius next episode Air Date and your others favorite TV Shows. Add the shows you like to a "Watchlist" and let the site take it from there.